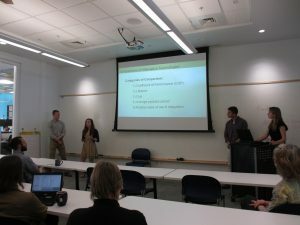 Students in Professor Molly Anderson’s ENVS 0401 Senior Seminar presented their work to a range of partners off-campus. The team that developed a Food Rescue Toolkit presented to the Food Cycle Coalition in Montpelier on May 5, 2016. The team that worked on Water Quality and Tile Drainage in Addison County presented to the Champlain Valley Farmer Coalition on May 11, 2016. 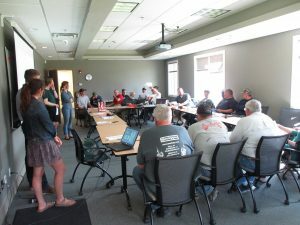 Lastly, the two teams that focused on energy efficiency considerations for greenhouses and maple sugar production presented to the Energy Cross-Cutting Team of Vermont Farm to Plate at Efficiency Vermont’s offices in Burlington.